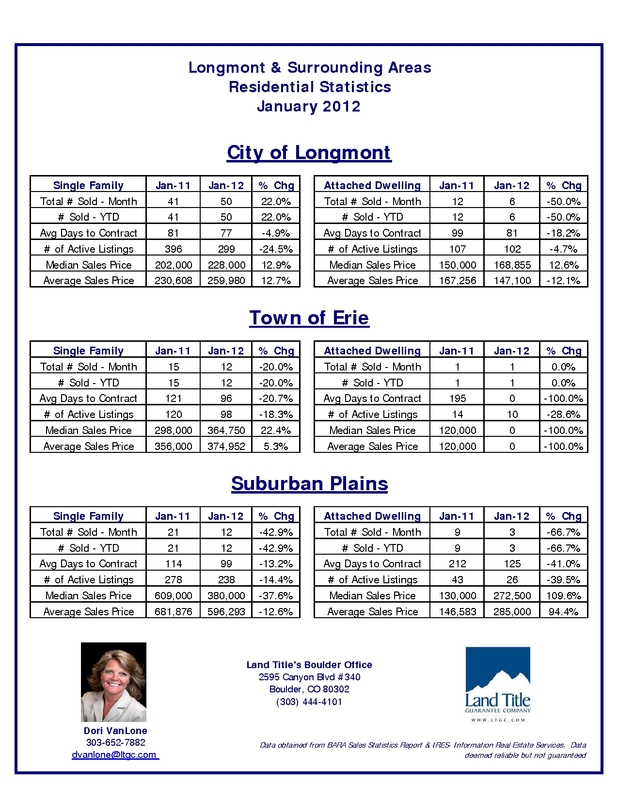 February New-Home Sales Highest in Seven Years | RISMedia. All of a sudden, the time to sell is now | REwired. Let’s back up to the third quarter of 2012, when 54% of the agents polled considered it a good time to sell, but 75% called it a good time to buy. This complete ‘180’ in the housing markets can only be backed by dangerously low inventory, prices that continue to appreciate and low interest rates pushing buyers to buy now. I recently wrote about a house my husband and I put an offer in on. I felt fairly confident about our offer and we’d managed to tour the house less than 24 hours after it had gone on the market, putting our offer in the same day. Unfortunately, within a day, four other offers were put in and the seller chose a higher one. As a buyer, this is discouraging. It’s frustrating to know there is zero ‘wiggle room’ when it comes to negotiations and often homes are selling above the appraisal value. On the other hand, I can only imagine sellers are riding high and feeling good, as multiple offers pour in on their homes within a day. In fact, 98% of agents surveyed by Redfin agreed that sellers are becoming more confident about the market. With that in mind, 83% of agents agree that buyers also are becoming more confident, so it’s not totally a lost cause for those of us trying to find a home. Working in this industry, I can’t tell you how many people I’ve heard say “the time to buy is now.” Well, as a buyer (often frustrated with this sellers’ market), I can tell you that the time to sell is now as well. Denver home prices rose twice U.S. average | Inside Real Estate News. Denver-area homes appreciated 12.1 percent in 2012 from 2011, twice the national average. “It is an index,” he said, and not just a change in the average or median price of homes. “I don’t pay too much attention to average and median prices,” he said, as they are influenced by the mix of homes selling. Thibodeau also said that low mortgage rates are here to stay. In fact, he said he doesn’t expect mortgage rates to skyrocket again in his lifetime. He said he expects that Denver-area homes could rise another 6 percent or so this year from 2012. Thibodeau said that Colorado homes did not have a bubble during the great recession. Formerly battered real estate markets such as Miami and Phoenix are currently staging big percentage gains. User activity will remain strong — Landlord market coming soon. Investment activity to stay strong. Rising home sale prices in metro Denver for June continued to outpace both the West region and the national average, according to a home price index report by Clear Capital released Tuesday. The Denver-Aurora metropolitan statistical area (MSA) saw home sales prices rise by 3.6 percent quarter over quarter in June, according to the Truckee, Calif.-based real estate data company. 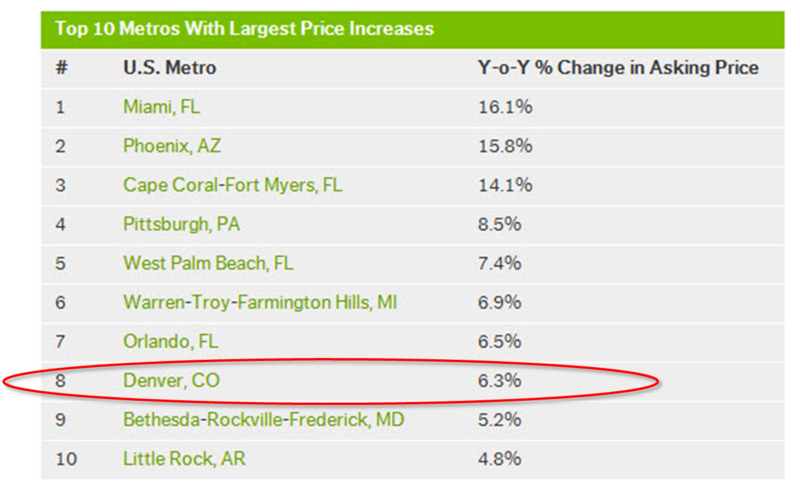 The index showed a 10.2 percent year-over-year increase in prices, ranking metro Denver 13th in the top 50 MSAs. 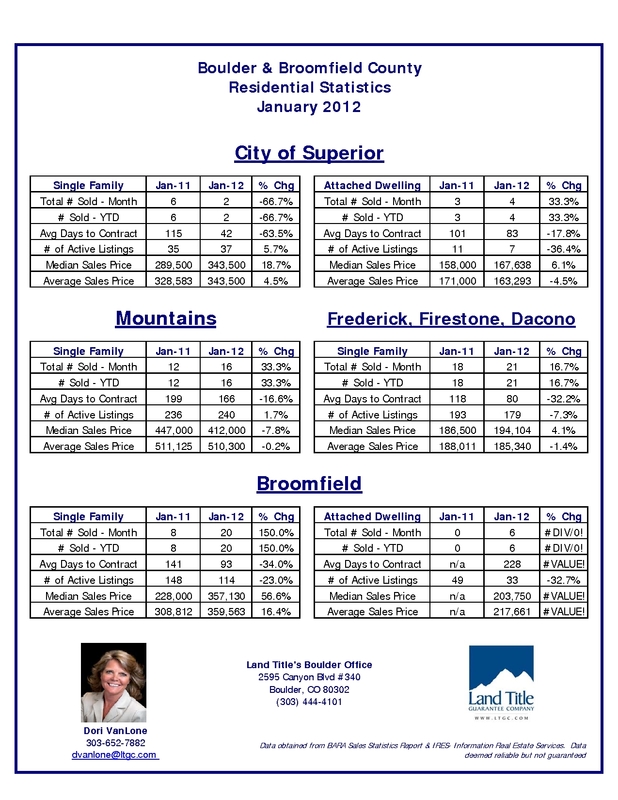 Metro Denver’s MSA had climb­ed into the top 10 MSAs, to No. 8, as recently as April with a 2.9 percent quarter-over-quarter growth in home sale prices and a 9 percent year-over-year gain. Denver-area home prices rising faster than rest of country – Denver Business Journal. Veros Real Estate Solutions, a leading private forecaster for the mortgage industry, projects home prices will appreciate in Colorado over the next 12 months. Helping boost this projection is was Freddie Mac reported new record lows for fixed U.S. mortgage rates. The average on the 30-year loan dropped to 3.62 percent- the lowest since long-term mortgages began in the 1950s. This will provide prospective buyers with more incentive to brave a modestly recovering housing market. read the full article here- Colorado Association of Realtors. Denver Housing Market Makes Gains! FW: Denver Housing Market Makes Gains! Nearly 30 cities have been designated “in the clear” of the housing downtown, according to a report today by Trulia, although real estate experts in some of those markets reacted to the apparently good news with conservative-sounding forecasts for their areas – or with downright skepticism. Amid hearty, annual asking price gains of 4 percent or more – and with relatively low foreclosure rates – Denver, San Jose, Pittsburgh, Little Rock, Austin and Colorado Springs each hammered out a “solid base for housing recovery,” said Jed Kolko, Trulia’s chief economist. Nationally, asking prices for homes flickered just 0.3 percent higher year-over-year in June after a flat May, Trulia reported. At the top of Trulia’s list: Denver recorded a 7.2 percent asking-price increase year-over-year in June, according to the website’s own pricing metrics. Meanwhile, 11.9 out of every 1,000 Mile High City homes is in foreclosure, reports RealtyTrac – as compared to far steeper foreclosure rates in cities like Phoenix (25.5), Miami (33.7), Orlando (29.3) and Detroit (21.2). While Miami (up 16.1 percent in asking price during June year-over-year), Phoenix (up 18.9 percent) and Detroit (up 5.2 percent) all won back solid ground on pricing, Trulia dubbed those metros as “at-risk” because they still have a high share of homes in foreclosure. Kolko expects price gains in those cities to ultimately shrink or even reverse as foreclosed homes in those areas come onto the market. Ironically, seven of the 10 cities with the very highest price increases in June (also including Orlando, West Palm Beach, and Cape Coral-Fort Myers, Fla., as well as Warren-Troy-Farmington Hills, Mich.), all were deemed “at-risk” in the Trulia report. On the sunnier side of the market, Trulia is sounding “in the clear” alerts for San Jose – with a 6.2 percent annual price spike and a foreclosure rate of 10.0 homes out of every 1,000 properties – and Pittsburgh (a 5.1 percent annual price gain and a foreclosure share of just 4.4 of every 1,000 homes). Kolko cites the unemployment rates in Denver (8.1 percent in May, according to the federal Bureau of Labor Statistics), San Jose (8.7 percent) and Pittsburgh (6.7 percent) as critical figures in those municipal comeback equations. The national unemployment average was 8.2 percent in May. But given the relatively lofty unemployment rates in Denver and San Jose during May, is their job growth really good enough to attract buyers? According to Kolko at least: yes. In both Denver and San Jose, real estate brokers contacted at random by msnbc.commomentarily chuckled at the notion that their markets are “in the clear.” They then offered nuanced views of their local housing economies. “We would be in the clear if the government got the heck out of the (real estate) business,” said Bob Stewart, the broker at Coldwell Banker, The Real Estate People, based in San Jose. Under federal initiatives like HUD’s Neighborhood Stabilization Program – during which 400 cities and counties have received billions of dollars to slash housing blight in foreclosure-ravaged neighborhoods – “speculators” have shoved local “investors” and Realtors aside, Stewart said, gobbling up distressed San Jose properties and re-selling them on the cheap. “Speculators went out and got their (real estate) licenses and are targeting underwater properties, getting them listed at a very low price and submitting an offer immediately to the lender. If the lender accepts it, they’ve made $300,000 to $400,000 (per house),” Stewart said. “There are enough of those here getting accepted that it’s keeping our prices” lower than they should be in San Jose. “The powers that be in the government really don’t understand the difference between investors and speculators,” Stewart added. Is it a sellers’ market? | The Coloradoan | coloradoan.com. Is it a sellers’ market? Sixteen months after putting her Fort Collins home up for sale in late 2010, and getting only one lowball offer, Laura Carlson yanked it off the market, frustrated it would never sell. Carlson hired real estate agent Sharianne Daily of Re/Max Alliance and relisted the house earlier this year, hoping the impending spring, recovering economy and record-low interest rates would bring more attention. Within two months of listing, Carlson received three offers in two days. She sold the home for $5,000 more than her asking price. “I was in a lucky situation in that I was still able to make my mortgage payments and wasn’t forced to sell, so I was waiting for the perfect time and perfect buyers. It all happened literally within 36 hours,” said Carlson, a nurse at Poudre Valley Hospital and a relief flight nurse with Greeley’s Flight for Life. “It was crazy how it all fell together like it was supposed to,” said Carlson, who put her house on the market after moving in with her significant other. Her story is being repeated throughout Larimer County as a previously sluggish, often dismal, sales environment gives way to a market frenzy. Homes priced at less than $300,000 are fetching multiple offers — sometimes in a single day — and selling for more than the asking price. The shift started to show up in March — the first month both home sales and the average sales price rose. The frenzied market is a whirlwind for Realtors scrambling to get clients to showings and offers made before the competition. Delays or hesitation can leave a buyer in the dust. “You have to strategize right now,” said Realtor Carolyn Wade of Re/Max Advanced Inc., in Fort Collins. “You can come in with a higher offer and still not get the property. It’s an unusual time. Everyone is enjoying the boom but also scrambling to get things for people using FHA” to finance their homes. The Federal Housing Administration doesn’t loan on more than a home’s appraisal, meaning they often get outbid by clients offering more than list price. Not only are rising prices starting to look like a real trend: they’re also coming to a market near you — if they haven’t already. Asking prices increased year-over-year in 44 out of the 100 largest metropolitan areas, with Miami and Phoenix leading the charge. Why these markets? One factor is job growth, which boosts housing demand. Miami, Phoenix, Warren-Troy-Farmington Hills (suburban Detroit) and Denver all saw strong employment gains in the past year. Another factor is the big price declines after the bubble, which attracted house hunters and investors searching for bargains to those markets. Most of the metros with the largest price increases in the last year had huge price declines during the bust, including Phoenix, Warren-Troy-Farmington Hills and the four Florida metros in the top ten. But among the metros with the largest price declines over the past year, only three–Sacramento, Las Vegas and Fresno–had huge overall price drops after the bubble burst. via Rising Home Prices: Coming to a Market Near You | Trulia Pro Blog. 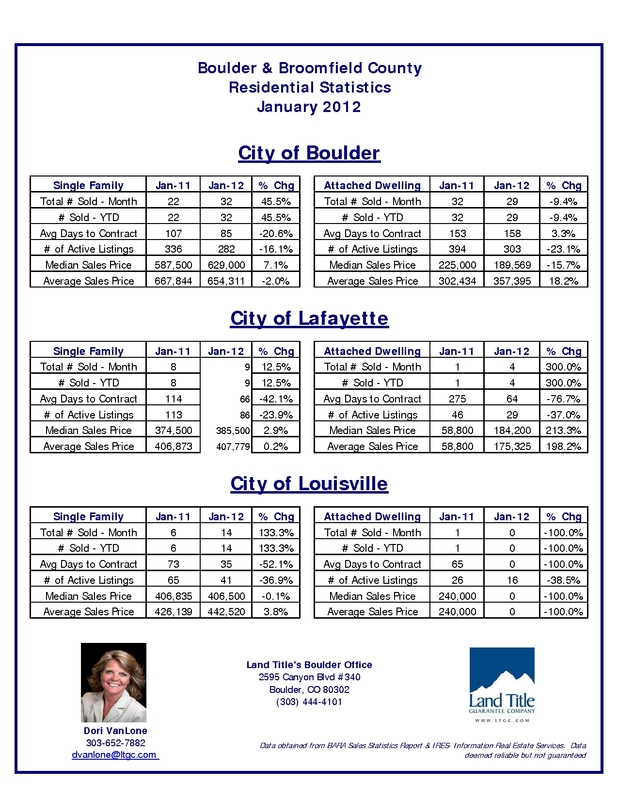 Below are the residential statistics for Boulder, Broomfield, Longmont and the surrounding areas. Area’s we serve: From Denver Metro to Northern Colorado and everywhere in between. Including: Fort Collins, Wellington, Bellvue, Laporte, Windsor, Loveland, Eaton, Severance, Timnath, Greeley, Evans, Kersey, Berthoud, Johnstown, Milliken, Frederick, Firestone, Dacono, Mead, Longmont, Boulder, Erie, Louisville, Superior, Gunbarrel, Niwot, Lafayette, Platteville, Broomfield, Thornton, Northglenn, Todd Creek, Westminster, Brighton, Ft. Lupton, Arvada, Wheat Ridge, Mountain View, Edgewater, Standley Lake, Aurora, Centennial, Stapleton, Park Hill, Montbello, Lakewood, Golden, Littleton, Highlands Ranch, Englewood, Commerce City, Henderson. When you’ve lived here as long as we have, there’s not a corner that we don’t know about. Put our area knowledge to work for you. Realtor working the Colorado front range for my clients ultimate benefit. How can I help you achieve your real estate goals today?